The first Episcopal service held in the town of Palmerton was at the Horsehead Inn on the fifth Sunday after Easter, May 12th 1901. The Rev. Marcus A.Tolman, Rector of St. Marks, at Mauch Chunk, officiating. During the following few years services were held wherever the small congregation could conveniently get together. The old Smith house, now the Rahn residence at Columbia Avenue and Fourth Street, Prutzman Hall, the Union Chapel on Lehigh Ave, and the West Plant office of The New Jersey Zinc, Co. (of Pa.) all provided shelter for the Episcopalian group. Services were held on the First and the Third Sundays of the month at 10:30 am. Since the first Sunday of the year the services were held in the Union Chapel on Lehigh Avenue, offered to us by the Trustees of the same. It has been somewhat more difficult for some of our people to attend services there owing to the distance, but on the other hand it has attracted new friends to the Mission and we are grateful to the Trustees for the privilege of using their building. On July 1st 1901, Palmerton was added to the Mission Stations, ministered to by St. Mark’s Church, Rev. C Thacher Pfeiffer, a curate in St. Marks’s, was placed in charge and took up his residence in Palmerton. Mr. Pfeiffer continued in charge until the Spring of 1902. He was succeeded by a number of young men who were either curates of St. Mark’s or those who were students in college preparing for the ministry. These changes continued until 1904 when Rev. A.A. Breese, a curate of St. Mark’s, was given the care of Lehighton and Palmerton. Mr. Breese remained in charged until July 1st 1907. In October of 1904 the Rector of St. Mark’s became aware of an offer made by Mr. Stephen Squire Palmer president of The New Jersey Zinc Company, of New York, to build a Church in Palmerton whenever it was desired. He purposed building, in Palmerton, a stone church in memory of his beloved wife, Susan Flanders Price Palmer. As the Rector had found in his own experience in the work at Palmerton that the greatest difficulty had been in finding a suitable place for service, he said that the Church ought to be built at once, if possible. Accordingly Mr. Palmer with some other gentlemen and the Rector met in Palmerton and selected a site for the Church. A lot adjoining the residence of Doctor Catterson on the west was selected and was shortly afterward deeded to the Board of Incorporated Trustees of Central Pennsylvania. It was generally understood that the building of the Church was to begin at once. The plans were not prepared however, until the coming of winter prevented the beginning of the work. A commission was given to Henry Janeway Hardenberg, of New York, to prepare the plans and build the church. Mr. Hardenberg most notably recognized for his work with a luxury apartment now known as the Dakota Apartments (1880–84) and the lavish Waldorf /Astoria Hotels (1893-1931), which established him as a leading architect for luxurious Edwardian hotels. Owing to Mr. Palmer’s absence in the South during the spring the contract was not let until about the middle of June. About the first of July the contractor, Mr. Ochs of Allentown, broke ground. The plans call for a stone Church with tower and Sunday School or Parish Room, and all who had seen them were much pleased. The general contour of the structure and its interior arrangement is patterned after a village church in old England. The location is a fine one and the grounds were to be beautified when the Church was completed. The Church was to be a great addition to the growing town; it will be one of the 15 and believed to be of a large importance in the development of Christian work. There seemed to be a decided demand for more frequent services at Palmerton. Two services a month when a month has five Sundays makes necessary on long interval of three weeks between services. It may be that if the demand continued when the church was completed that arrangements would be made to provide them. Mr. William A. Clason, a practical builder, representing Mr. Hardenberg, the architect, is in residence at Palmerton superintending the whole work of construction of the Church and will remain until it is completed. This was to ensure that everything would be done, as it should be. On the afternoon of Thursday, September 7th 1905 under autumn weather conditions that were perfect, in the midst of a notable gathering of people, the Corner Stone of St. John’s Church was duly laid. The Rector officiated, assisted by Archdeacon Thompson, and the Rev. A.A. Bresee, minister in charge at Palmerton. The address, which was both eloquent and most appropriate, was by the Rev. Dr. Townsend, Rector of All Angel’s Church, New York, of which parish Mr. S.S. Palmer the donor of the Church is a communicant and vestryman. The music was rendered by the Choir of the church at Palmerton, supplemented by the Choir of St. Mark’s. The series of services most interesting to church people in the Lehigh Valley reached a climax with the consecration of St. John’s the following autumn, on October 11th 1906. The Bishop of the Diocese officiated consecrated the edifice, naming it after Mrs. Palmer’s home church, Saint John’s of Elizabeth, NJ. and preached a strong and most appropriate sermon from St. John 17:19. He was assisted in the service by the rector of St. Mark’s Church, who read the request for consecration, the Rev. B. S. Sanderson of Bethlehem, who read the sentence of consecration, the Rev. Dr. Sterling of South Bethlehem, and the Rev. A.A Bresse, Curate in charge, who read Morning Prayer, the Rev. J. M. Hayman, Germantown, the Epistle, the Rev. Dr. Townsend, of New York, the Gospel. the Rev. D.T. Weidner, of Mauch Chunk, (now Jim Thorpe). The vested choir of St. Mark’s Church took the musical parts of the service, and rendered them with fine effect. The congregation filled the Church and a large portion of the Sunday School room. A large party of intimate friends of Mr. S.S. Palmer came up from New York and other neighboring towns, while Mauch Chunk, East Mauch Chunk and Lehighton contributed about seventy-five people. Local interest was shown by the closing of several of the public schools, and the attendance of both teachers and pupils. Evidently the consecration of the Church was looked upon as an event of great importance to Palmerton, and if all within the reach of its influence will only look upon it as their spiritual home, and attend its services, the hope of its generous founder and those who have its interest in charge will be realized. The appearance of the interior, especially the well-appointed chancel on this consecration day, with its unique vases, lights, and beautiful embroidered alter cloth, surpassed all expectations. Happy should be the people who can worship their God amid such suggestive and complete appointments. After the consecration the congregation was invited by Mr. Palmer to partake of a bountiful luncheon at the Horse Head Inn. After the consecration, the Rev. A.A. Bresse, Curate, then held service every Sunday morning and a Sunday School had been established. Also after the consecration a number of beautiful memorials had be placed in the church, among others a Westminster peal of bells, an Esty pipe organ and in the east and also west windows by Tiffany, a stone font and brass ewer, altar linen and silk hangings, a lectern an lectern Bible, a magnificent communion service, the chalice of which had a small gold triangle attached to the handle, in the center of which is a sapphire and in each corner is a diamond, also silver offertory plates and receiving basin. The landscaping with the creek running through the Church Park and the Palmerton Borough Park to the south has provided the church with a beautiful setting. It has often been called a poem in stone. The Rector at a service on October 28th, confirmed a class of four, preached a most appropriate sermon and acting under the Bishop’s advice appointed five gentleman a committee to secure subscriptions for support of the church and to administer its local affairs. Those appointed are Messrs. (Mr.’s) R.H. Dodd, H.N. Blunt, Dale Craig, F. Thorpe and Joseph Browell, and all had accepted their appointment. The Parish House was added to the church in 1934, providing much need place for the Sunday School and social activities of the church and community. Beginning on January 1, 1975 until December 31, 2005 E.M.U. or the Episcopal Ministry of Unity was formed. All Saint’s Episcopal Church in Lehighton and St. John’s Episcopal in Palmerton celebrated their decision to join together as one Church sharing a Rector, an office and a part-time secretary, while preserving their individual identities and maintaining a Sunday schedule in both places. The union had grown since 1975 in ways not envisioned by the Vestries of the 60’s and 70’s that contemplated a merger and lived through its earlier days. Two separate vestries now acted as one, making decisions in common. Three budgets, one for each church and one for the union, were merged into a single budget. A unified financial statement enables careful stewardship of sources. A complete schedule of worship in each building remained in place with two clergy dividing responsibility on a rotating schedule. December 31, 2005, due to financial struggles, the two churches were once again separate entities at the suggestion of Bishop Paul. In the fall of 1978 we were again blessed to have one of our own community members become a member of the Clergy. Sharing over 30 years of her ministry as a Priest and Friend with, to and among us, The Rev. 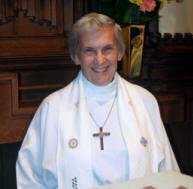 Canon Doris Steinmetz Bray, served as our Associate Rector Emeritus.